Happy Mother’s Day! I hope all mothers are enjoying the weekend and their special day. 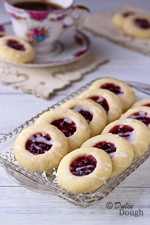 These easy-to-make Raspberry Shortbread Thumbprint Cookies are a nice dessert for Mother’s Day or any day. They are flavored with almond extract which gives them a wonderful flavor to compliment the raspberry jam or the jam of your choice. To keep the size of these cookies uniform, I used a small cookie scoop to aid in forming the dough. And instead of using my thumb to make an imprint for the jam, I used the cap of my almond extract bottle. I also spooned the jam into a plastic baggie, cut off the corner, and then used it like a pastry bag to fill the cookies with jam. I cannot take credit for coming up with any of these ideas—they were all ideas that people had posted in their reviews of these cookies at allrecipes.com. Buttery almond shortbread cookies filled with raspberry jam and drizzled with almond glaze. 1. Beat together butter, sugar, and 1/2 teaspoon almond extract in a large bowl until light and fluffy.2. Gradually mix in flour until combined.3. Heat oven to 350°F.4. Use a small cookie scoop to measure dough; roll dough into 1- inch balls.5. Place dough balls 2 inches apart onto ungreased cookie sheet.6. Using your thumb or a small cap, make an indention in the center of each cookie.7. Fill each indention with about 1/4 teaspoon of jam.8. Bake for 14 - 16 minutes or until the bottoms of the cookies are very lightly browned.9. Allow cookies to cool for about a minute on the cookie sheet, then move to a cookie rack to cool completely.10. To make the glaze, combine confectioners' sugar, almond extract, and milk in small bowl, adding the milk gradually until the desired consistency is achieved; drizzle over cooled cookies. Recipe adapted from allrecipes.com and Land-O-Lakes. These are so pretty Jill. Great idea to use the cap from a bottle that way they're all even. So pretty. Thanks for sharing and Happy Mothers Day to you as well. I love these cookies. I just "stumbled" them! I love thumbprint cookies! These are adorable - perfect for Mother's Day. I would munch on them all day long :) Happy Mother's Day, Jill! Such lovely cookies- I will be trying these soon. The almond flavor is a great addition that I just love! We loved this one too! 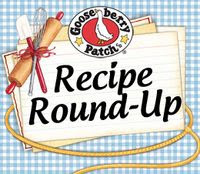 I love how you always I’ve backstory on the recipe – very informative! Feliz día muchas bendiciones para usted ...sus galletas son bellísima y deliciosas ..excelente combinación ,abrazos hugs,hugs. These cookies are so pretty! They are perfect for a Mother's Day gift! Happy Mother's day Jill! Hope you're having a wonderful day! These cookies are so very pretty...just like those I usually read from the stylish food magazines! I've been meaning to make thumbprint cookies for so long, but it always slips my mind!! I think I need to get this tattooed to my wrist or something. These look so professional-like something you would see in a bakery. Also, I do like thumbprint cookies since they lend themselves to so many different variations. Your flavors here do sound like a great combo. Perfect for tea time or mothers day. Enjoy your mothers day! These cookies are so pretty. And what a great idea to make the indentations with an almond bottle cap! No wonder they turned out so beautifully! What a beautiful treat for Mothers Day, Jill. I love the raspberry/almond combo! Happy Mothers Day to you. I love the little drizzle of icing on top. your photos are so amazing. Beautiful cookies. I love the drizzle of icing on top. Your photos are amazing. I like thumbprint cookies so much, specially this kind that you feel it melted in your mouth but also have that chewwy part given by the jam. These thumbprint cookies look gorgeous! Would love to have that with tea. This would be lovely for Mother's Day or anytime. Your pictures are gorgeous! Happy Mother's Day to you!!! These raspberry cookies would be pretty for Mother's Day, especially a brunch...they look so yummy! I really like the idea of using the flavoring bottle cap to make the imprint...always appreciate these extra tips! Hope your Mother's Day was real sweet! I love thumbprint cookies :) Usually, they only appear in my house around Christmas, and are often overlooked. Making them for mom is such a great idea! Happy Mother's Day! I just saw this picture on Foodgawker and couln’t stop appreciating!! The recipe is great and I am determined to try this now!!! Delicious shortbread thumbprint cookies. Awesome. Pretty tea cup. Happy mother's day to you . Your photo is cookbook worthy...so lovely! And your cookies look just as amazing!!! Such a beautiful cookie! Looks pretty tasty too! Cookies looks super good..:) They look very pretty.. Enjoyed browsing through your recipes.. I made these earlier tonight. Although they were delicious they came out incredibly flat. I think you forgot to mention in order to keep them round and puffed like yours you need to refrigerate the dough for at least 1 hour. I found this out according to the original recipe from Land-O- Lakes butter. No, actually I didn't refrigerate the dough at all with these. The directions I posted are exactly the way I made them. When I made them I noticed the directions at Land-O-Lakes varied from the version at Allrecipes. The Allrecipes version did not say to refrigerate the dough, and when I tried them without refrigeration they turned out great. But, there are so many variables with baking so I am glad refrigerating them worked for you! I made these in the spring, but on a hot, humid summer day they might have needed refrigeration. I made these just about an hour ago. I followed your directions exactly and they turned out perfect! Not flat at all. They are delicious and look fantastic. One thing I did do, which wasn't specified in your directions was, I did not melt or soften the butter. I assume most would soften the butter? I am not sure if that might have made a difference? I took solid sticks of butter right out of the refrigerator and cut them into small squares, perhaps 1/2 to 1 tablespoon each, and dropped a few into the sugar. Once the mixer was going, I continued to add the butter this way until it was all in. Otherwise, I did everything as you said. They are so good! Thank you! Hi! I'm trying to make these to give away this Christmas, but I've just realised I'm not sure if the flour is self-raising flour or just plain flour. Help! I'm trying to make these cookies to give away for Christmas but I've just realised I'm not sure if the flour you use if plain or self raising! Help please! I used all-purpose flour in this recipe. Great recipe! These cookies came out gorgeous :) Perfect for a holiday treat!! Great recipe!! These cookies came out gorgeous :) Perfect for the holidays! Wonderful!!! They turned out fabulous!! Can't wait to bring them to our church luncheon. I used the end of my wooden spoon to create a perfect little whole to fill. Thanks for a great recipe, I have printed it so I can use it again & again!!!!! Just tried this recipe today and I love it! The cookies came out just like in the photo, and the almond flavor is wonderful. I used a 1/2 tsp measuring spoon to fill the cookies with jam, and it was the perfect size for my holes. Cookies sound so yummy!! Do you think they will hold up if frozen?? These are really fantastic! (Just made them.) I added in two eggs because my dough was too crumbly (is it supposed to be that way?). I don't remember the dough being crumbly when I have made these. Glad you adapted and the recipe worked! There are so many variables in baking that sometimes that's what you have to do! I used your recipe for a cookie swap my friend is organising. Followed the recipe exactly and they came out looking oh-so-perfect! And they taste incredible. Do you think I would be able to swap out the flour for almond flour? Fabulous! My new favorite cookie. All went as written. Tastes even better the next day and after. Thank you! These are a favorite of all. I literally find myself making them for every function! I get requests for them regularly and everyone loves them. I share your site often. I like to use other jams per request of my loved ones to change it up, but raspberry for sure is always a winner! Thanks again for making me the best cookie baker ever with this award winning recipe! I've been using this for years without fail. Perfection. I'm always so unsure about this. I know the rule of thumb is to use unsalted butter in baking, but I'm wondering since salt is not in the recipe, do I use salted butter instead? Thanks for your help! do you use salted butter or unsalted butter?